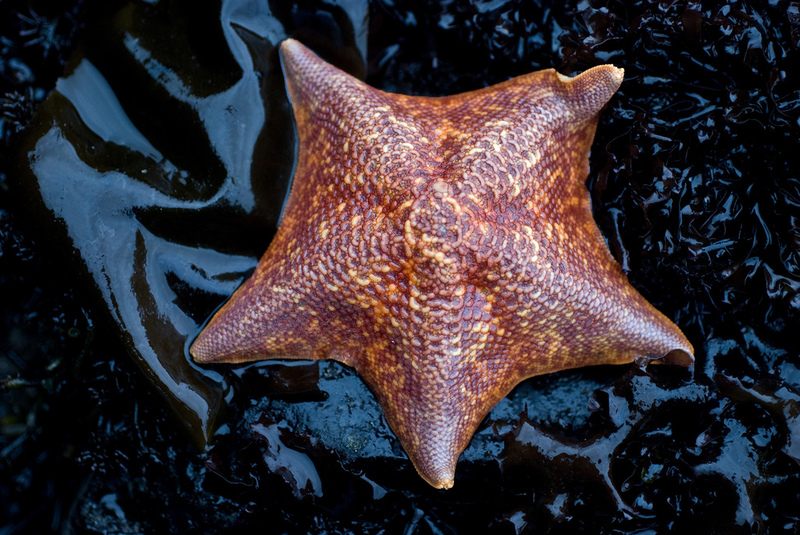 Since last summer, scientists and tidepoolers up and down the Pacific Coast have noticed starfish dying in startling numbers. Some observers have documented sea star bodies turning to mush, others described the creatures disintegrating, while others found stars that lost their limbs and color. The name of this phenomenon: "sea star wasting disease." Scientists don't know how many starfish have died so far. Pete Raimondi, chair of the Department of Ecology and Evolutionary Biology at University of California, Santa Cruz, says it could be in the millions. 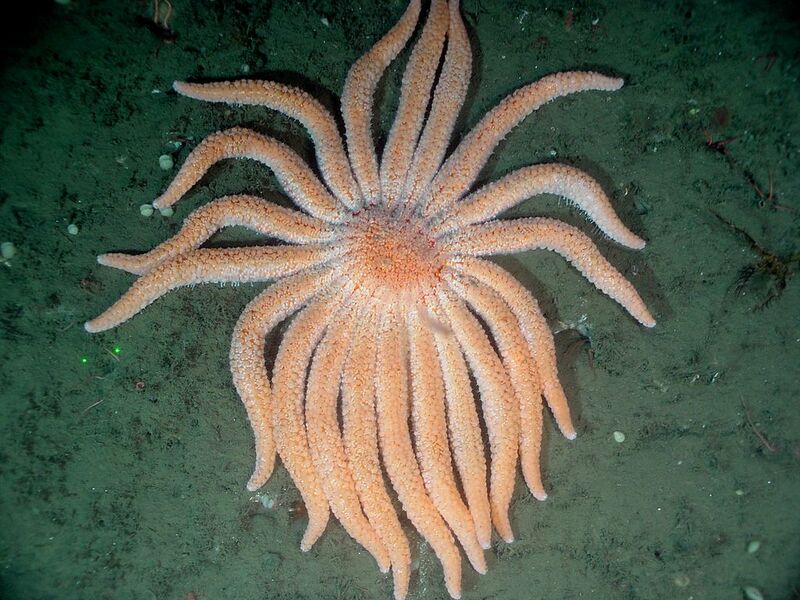 One particularly hard-hit species, the sunflower starfish, has "pretty much disappeared," Raimondi said. Raimondi and Benjamin Miner, professor of marine biology at Western Washington University, spoke on Forum about the latest outbreak of this mysterious disease. While similar die-offs have happened before, scientists are flummoxed about the cause. Why is the wasting disease so difficult to nail down? In short, its pervasiveness. According to Raimondi, researchers studying the problem are leaning toward the theory that "it may be a pathogen of some sort that is distributed through ocean currents or other oceanographic forcing." Still, there is no scientific consensus on that and neither Raimondi nor Miner is willing to stake a claim on a singular theory. "The patterns that we’re seeing make it especially perplexing because we’ve seen major die-offs in regions that are geographically separated," Miner said. "For example, Santa Barbara, Monterey, the Seattle area, British Columbia and the Vancouver area. And then some areas in between those appear quite healthy. So the locations, in addition to the fact that it's affecting many species, some of them rather distantly related among sea stars, makes it really challenging." Miner said that, so far, a natural occurrence is the most likely explanation. There is one tantalizing clue. All of the three major starfish die-offs in the past 40 years—the late 1970s, 1983-84 and 1997-98—were associated with a warm water event. They were not necessarily caused by a warm water event, however. It could be that warm water coming up from the south carried a pathogen, Raimondi said. Or "it could have been a local species that went rogue, essentially, during those warm water events." With the source of sea star wasting disease unclear it would be easy to dismiss the phenomenon as one huge mystery. But in truth, scientists do know a fair amount about the disease, including what is not causing it. In case you're already pondering some of the following theories, Raimondi suggests you discard them. Plastic pollution: “We’re talking about completely pristine areas to completely degraded areas, and we don’t see any pattern that is suggestive of (plastics)." Ocean acidification: "What we've seen with respect to ocean acidification is that there are local areas which can be affected, but we don't see any broad pattern of it." Fukushima radiation: "The trajectory that has been proposed with respect to the distribution of any of the debris really doesn’t come very far south. And with respect to the radiation, that wouldn’t have arrived here yet. Also, just the distribution of the disease and apparent lack of the disease in other areas, really doesn’t lend itself to (a Fukushima link)." Although climate change is warming the ocean overall, the ocean along the West Coast has been in a cool period, Raimondi said, since the 1997-98 El Niño. "The water's been cool," he said. "There may be local warming areas but in general it’s been a cool phase and so it doesn’t appear that this (die-off) is related to any general climate-related warming." That doesn’t, however, rule out some sort of climate change connection, he said, for example, ocean currents may be moving in different directions. And Miner adds that climate change could, say, be suppressing sea stars' immune systems and making them more susceptible to a lethal pathogen. None of the species affected by the previous die-offs is extinct and most have recovered, albeit slowly. "I don't think anyone at this point is thinking that this system is not going to recover as well," said Raimondi. One of the reasons for Raimondi's optimism has to do with the life cycle of sea star larvae. Most of the affected species have long-living larvae that can survive the travel to unaffected sections of the coast, where they can populate new areas. And not all species are affected in the same way by the wasting disease. Bat stars, which seem not to be negatively affected by the disease, are actually thriving because they're able to feast on the bodies of other dead sea stars. Giant sea stars have been relatively resistant to it too. Sea stars in tidepool systems and subtidal systems (basically, areas that are always under water, even during low tide) are both suffering from the wasting disease. But Raimondi says the subtidal systems are more affected. This makes gathering accurate data difficult because scientists have limited access to underwater locations and most citizen-scientists who may report their observations encounter starfish in tidepools. Raimondi and Miner encouraged beach goers, fishermen and divers to share their observations—whether on shore or out in the water at seastarwasting.org.